Getting the job done right requires the right tools. 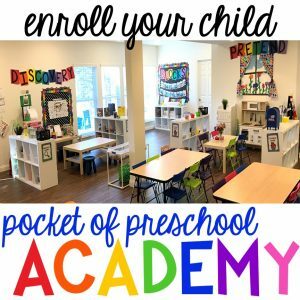 To help you teach your little learners effectively, I have created a list of favorite teacher’s tools for preschool and kindergarten. All of these teacher’s tools come in very handy while teaching. They help make my classroom run smoothly and allow me to get the job done right the first time around! These dots are very helpful to have in the classroom. They allow for quick and easy attachment, without the hassle. My new favorite thing! Where have these been all my life? Give paper a little durability with this handy teacher’s tool. It is super easy to use and it can laminate up to 9″ at a time. These Thermal Laminating Pouches make the process easy to use. This clever tool requires no heat at all. I use it to laminate file folders games and things that are too long for the laminating pockets! It is set up to use a drop-in cartridge. Amazon carries the Laminate Refill Cartridge and the Magnetic Refill Cartridge too. Who knew that something as simple as paper could be a teacher’s favorite tool? I prefer this brand because of the high quality, and the vibrant colors. Cut paper to the precise measurement you need all with straight lines. This paper cutter makes handling paper a breeze. The fold-out ruler comes in handy too. Punching out circles cuts time in half with the help of this paper punch. It comes in a ton of sizes and shapes too! Easy to hold and cuts through paper with very little effort. Perfect for crafts….I am not good at cutting circles. Every preschool and kindergartner teacher needs one of these! They make a great gift too! Simple and to the point. The tiny humans agree, this t-shirt also makes a fantastic gift idea. Keep these little rings on hand to make a variety of teaching resources including class books and vocabulary cards. These help me keep supplies organized. This is the best hole punch ever. It can punch up to 20 pieces of paper at a time and it works with very little effort! Say goodbye to staples with this staple free version. This tool uses the paper to attach all of the pages together! You will never have to worry about running out of staples again. And you can put it in the writing center worry free for kids to use! These plastic pockets allow students to write answers with dry erase pens and erase them so they are ready to be used again and again! This set of dice have a whiteboard material on each side which allows you to write or draw whatever you would like onto the dice… numbers, letters, shapes, students names, ect. You can use these with the two products above as well as on a whiteboard. This set comes with a rainbow of colors to use. A set of classroom clipboards come in handy all throughout the year. This portable writing surface can be used for everyday projects around the classroom (and outside too)! This pad of paper is large enough to help when teaching the entire class. The lines help keep everything in order to make learner in a group easier for students. These sticky notes work as great reminders for teachers. You can stick them anywhere… the perfect assistant. Rolls of colored masking tape are a favorite tool of mine because instead of using the bland beige tape, we now have access to a rainbow of colors. You can have sharp pencils in a flash with the help of this electric pencil sharpener. This teacher’s tool comes in handy when you want to display pictures or other paper. All you need to do is slip the paper into the pocket. Thanks to the clear pocket material, everything on the paper or picture is visible. I have this one in my writing center. You can use these for a variety of storage needs. I like these because they are easy to stack and they are see through. Attach a label for easier identification. Click HERE to watch my FB LIVE on how I use them to organize all my themed center things. This set of markers will give your little learners some great coloring time. I love how bold the colors are and the scents are even more enticing to students. Plus they smell so yummy! 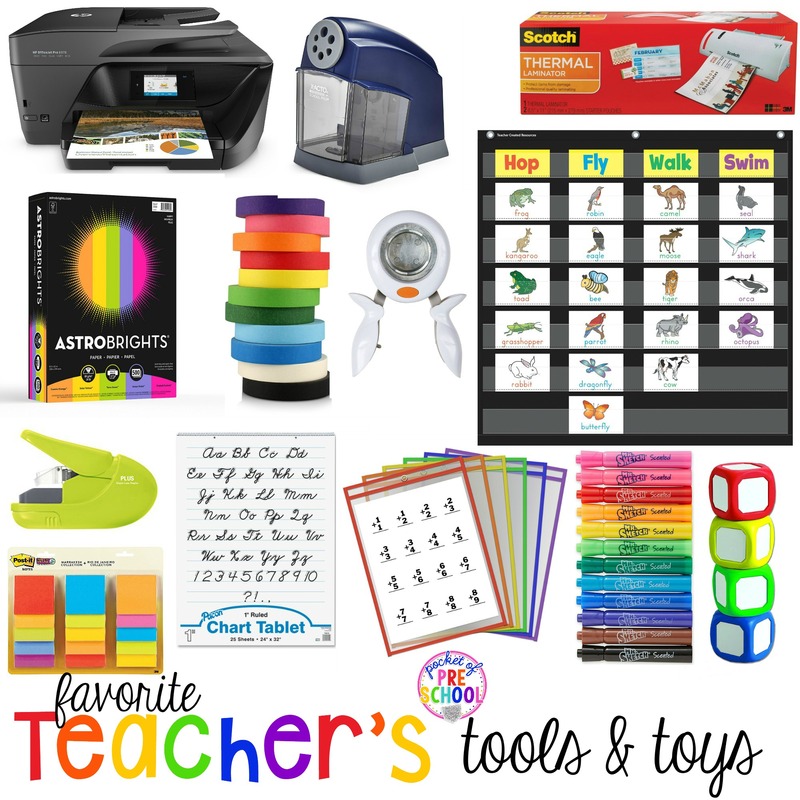 Keeping these tools in the classroom makes teaching a little bit easier. These are my favorite teacher’s tools for little learners. I think that I would be lost without these products! Share some of your favorite teacher’s tools with us all in the comments! Love these tools? Pin this image! Check out more of my teacher hacks that will save you time (and energy) in the classroom!